Boatswain Lord Byron's beloved newfoundland dog died at the age of only five years after contracting rabies. The famous poet is reputed to have said at the time: "he expired in a state of madness on the 18th after suffering much, yet retaining all the gentleness of his nature to the last; never attempting to do the least injury to any one near him. I have now lost everything"
The poet is reported to have nursed the dog throughout his illness, without fear of being bitten and contracting the awful disease himself. Near this Spot are deposited the Remains of one who possessed Beauty without Vanity, Strength without Insolence, Courage without Ferosity, and all the virtues of Man without his Vices. 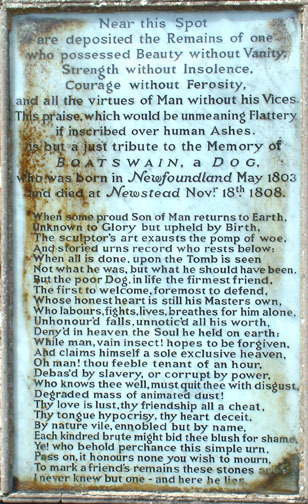 This praise, which would be unmeaning Flattery if inscribed over human Ashes, is but a just tribute to the Memory of BOATSWAIN, a DOG, who was born in Newfoundland May 1803 and died at Newstead Nov. 18, 1808. Pass on - it honors none you wish to mourn. I never knew but one - and here he lies. In his Will, executed in 1811, Byron instructs that he be buried in the vault with Boatswain. In fact the dog's tomb at Newstead Abbey, is bigger than Byron's own.